Citation Information: J Clin Invest. 2016;126(11):4262-4272. https://doi.org/10.1172/JCI84813. The adoptive transfer of T cells that have been genetically modified to express a CD19-specific chimeric antigen receptor (CAR) is effective for treating human B cell malignancies. However, the persistence of functional CD19 CAR T cells causes sustained depletion of endogenous CD19+ B cells and hypogammaglobulinemia. Thus, there is a need for a mechanism to ablate transferred T cells after tumor eradication is complete to allow recovery of normal B cells. Previously, we developed a truncated version of the epidermal growth factor receptor (EGFRt) that is coexpressed with the CAR on the T cell surface. Here, we show that targeting EGFRt with the IgG1 monoclonal antibody cetuximab eliminates CD19 CAR T cells both early and late after adoptive transfer in mice, resulting in complete and permanent recovery of normal functional B cells, without tumor relapse. EGFRt can be incorporated into many clinical applications to regulate the survival of gene-engineered cells. These results support the concept that EGFRt represents a promising approach to improve safety of cell-based therapies. Truncated EGFR implemented into a T2A-containing gene expression vector allows for stringent coexpression of recombinant proteins. (A) Schematic representation of the human EGFR (huEGFR) illustrates the structure of the WT EGFR, including 4 extracellular domains and an intracellular tyrosine kinase domain. The truncated form of the EGFR (huEGFRt) lacks domains I and II and most of the cytoplasmic region of the full-length EGFR. 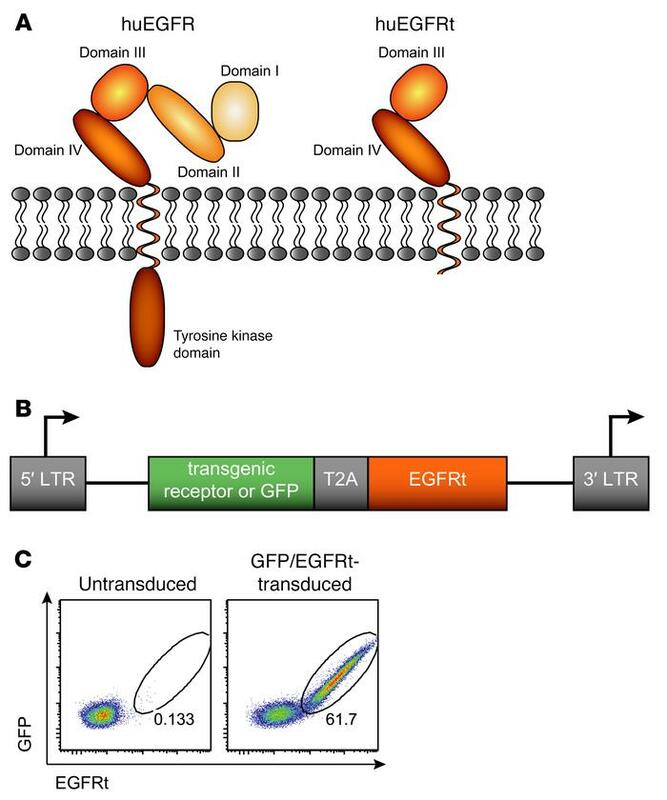 (B) The EGFRt can be included into gene expression vectors, e.g., encoding for a transgenic receptor or GFP, including a T2A linker for coexpression. LTR, long terminal repeats; T2A, Thosea asigna virus 2A peptide sequence. (C) Mouse splenocytes were transduced with a GFP/EGFRt gene construct. EGFR expression was detected with a biotinylated anti-EGFR mAb and streptavidin-phycoerythrin on day 4 after transduction. Cells were pregated on living lymphocytes, and numbers indicate the percentage of GFP/EGFRt+ cells. Similarly stained untransduced cells served as a negative control.